11.15 a.m., Holy Communion, Holy Trinity Church, Rathkeale, Co Limerick. Readings: Exodus 24: 12-18; Psalm 99; II Peter 1: 16-21; Matthew 17: 1-9. May I speak to you in the name of + the Father, the Son and the Holy Spirit, Amen. For the past few weeks, our Gospel readings have taken us through Saint Matthew’s account of the Sermon on the Mount, which is akin to Christ setting out a new covenant between God and us. The Gospel reading this morning takes us to the top of a mountain again for a new understanding of the covenant between God and us. There is already an allusion to the Transfiguration in our Epistle reading, where Saint Peter tells us he has been an eyewitness ‘of his sovereign majesty’ (see II Peter 1: 1-18). ● Saint John receives his Revelation in the cave at the top of the mountain on Patmos. As for the cloud, the cloud’s descent in terms of overshadowing (episkiazein), is a pun on the Greek the word tent (skenas), but is also the same word used to describe the Holy Spirit overshadowing the Virgin Mary at the Annunciation (Luke 1: 35). In the Old Testament, the pillar of cloud leads the people through the wilderness by day, just as the pillar of fire leads them by night. The cloud takes Christ up into heaven at the Ascension (Acts 1: 9-10). Saint Paul talks about the living and the dead being caught up in the cloud to meet the Lord (I Thessalonians 4: 17). Christ is the focus of the Transfiguration, but who are the other principle characters in this story? They come in three sets of three. ● God the Father speaks from heaven: ‘This is my Son, the Beloved; with him I am well pleased; listen to him’ (Matthew 17: 5). ● God the Son is transfigured. ● God the Holy Spirit is present in the form of a cloud. 2, The second set of three is provided by Christ in conversation with Moses and Elijah. ● These two principal figures in the Old Testament represent the Law and the Prophets. ● They both experienced visions of God – Moses on Mount Sinai and Elijah on Mount Carmel. ● They represent the living and the dead – Moses and Elijah also stand for the living and dead: Moses died after a long life and his burial place was known; Elijah was taken alive into heaven in a chariot of fire and was to appear again before the coming of the Messiah (see Malachi 4). Of course, the expectations and mission of Elijah are fulfilled in the mission of John the Baptist. Moses and Elijah show that the Law and the Prophets point to the coming of Christ, and their dialogue with Christ symbolise how he fulfils ‘the law and the prophets’ (Matthew 5: 17-19). 3, The third set of three is the three Disciples, Peter, James and John, who are with Christ on the mountain top. In the Exodus story, Moses goes up the mountain with three trusted companions to confirm the covenant (Exodus 24: 1). In some ways, Peter, James and John serve as an inner circle or a ‘kitchen cabinet’ in the Gospels. They are at the Transfiguration (Matthew 17: 1, Mark 9: 2; Luke 9: 28), but also at the raising of the daughter of Jairus (Mark 9: 2; Luke 6: 51), at the top of the Mount of Olives when Christ is about to enter Jerusalem (Mark 13: 3); they help to prepare for the Passover (Luke 22: 8); and they are with Christ in Gethsemane (Matthew 26: 37). They are the only disciples to have been given nicknames by Christ: Simon becomes the Rock, while James and John are the sons of thunder (Luke 5: 10). Peter is the rock on which the Church is built, James is the first of the apostles to die a martyr’s death, and John is the beloved disciple. They are a trusted group who also represent us at each moment in the story of salvation. We mark the Transfiguration just before Lent because, in early Church tradition, the Transfiguration is connected with the approaching death and resurrection of Christ, and so was said to have taken place 40 days before the Crucifixion. This event comes at a critical point in Christ’s ministry, just as he is setting out on his journey to Jerusalem. He is soon to experience the humiliation, suffering, and death of the Cross. However, the glorious light of his Resurrection is revealed at this moment to strengthen his disciples for the trials that they soon experience. In Orthodox icons, these three, Peter, James and John, are terror-struck by what is going on, displaying their amazement and reactions to the mightiness of Christ’s glory. 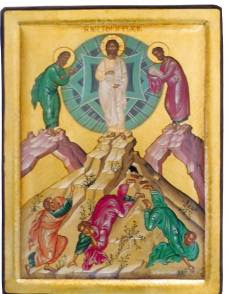 Some icon writers show Christ leading the three disciples up the mountain and down again. The Gospel narratives tell us that the disciples, startled by the brightness, turned their heads away, although Peter – as the icons show – saw Christ. He is traditionally coloured with green and locates on the bottom left. The position of his hands is a reminder of prayer. The garments of the three Disciples are often shown in a state of disarray, indicating the dramatic impact the vision has on them. They throw themselves to the ground in fear, dazzled by the supernatural light. Their postures show their response to the Transfiguration. In those icons John in the centre has fallen prostrate. Often, he has fallen head over heels, supporting himself with his right hand and covering his face with the other. Peter is rising up from a kneeling position and raises his right hand towards Christ as he speaks, expressing his desire to build the three booths, tabernacles or tents. James falls to the ground or falls over backwards, attempting to cover his eyes with his hands to prevent himself from seeing more. If the apostles’ eyes are closed or shielded, Saint Luke in his account says they were weighed down with sleep (Luke 9: 30-32), and these three later could not stay awake in Gethsemane. 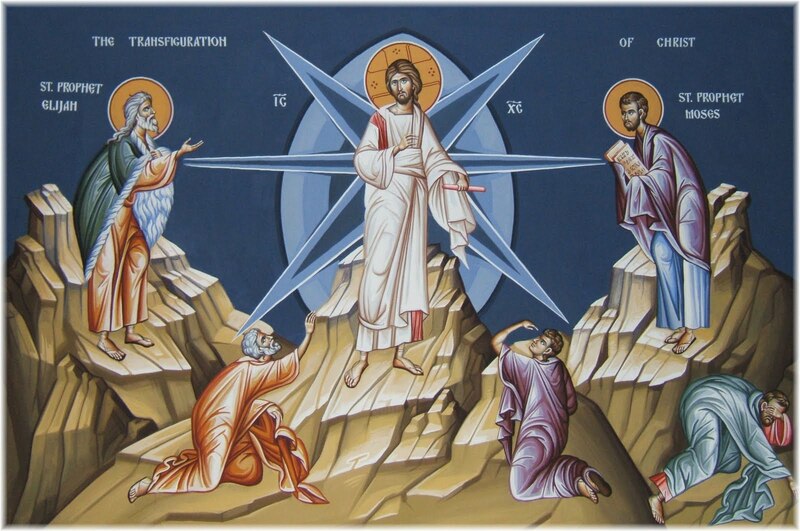 Theophanes the Greek in his icon shows that the Transfiguration is about both ascent and descent. To see the transfigured Christ, we have to leave behind the familiar, but we also have to come back down to earth again. There can be no staying permanently in an unnaturally extended religious comfort zone. Indeed, in the two smaller scenes in his icon, Christ is paying more attention to the disciples on the way down than he is on the way up. The Transfiguration is not a static moment, but a drama and a moment full of movement. The Transfiguration is a narrative to open our eyes and hearts to a different, more allusive way of looking at the Gospel: here are live, happening events, real human beings, and challenges to the past, the present and the future. In climbing the mountain, the three disciples find there is a considerable distance between them and Christ. It is the story of a world that has still to be reconciled; it is the story that lives with the tensions of an unreconciled world, it beckons and it challenges. At the Transfiguration, both the humanity and divinity of Christ are manifested to the disciples – and to us. 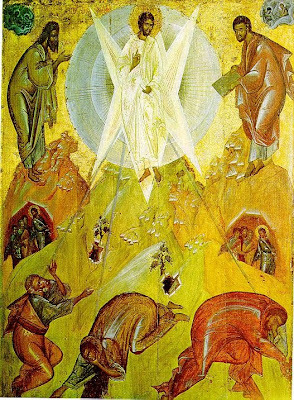 The Transfiguration also points to Christ’s great and glorious Second Coming and the fulfilment of the Kingdom of God, when all of creation will be transfigured and filled with light. This is not only a prefiguration of the eternal blessedness to which we look forward, but also of the Kingdom of God already revealed, realised and come on earth. The Transfiguration is both an event and a process. The original Greek word for Transfiguration, metamorphosis (μεταμόρφωσις), means more than changing from one form into another. The word means ‘to progress from one state of being to another.’ Consider the metamorphosis of the chrysalis into the butterfly. The process of metamorphosis invites us into the event of becoming what we have been created to be. Saint Paul also uses the word metamorphosis when he describes how the Christian is to be transfigured, transformed, into the image of Christ (II Corinthians 3: 18). Transfiguration is a profound change, by God, in Christ, through the Spirit. And so, the Transfiguration reveals to us our ultimate destiny as Christians, the ultimate destiny of all people and all creation to be transformed and glorified by the majestic splendour of God himself. In the closing stages of this story, Christ tells the three disciples, ‘Get up and do not be afraid’ (verse 7). They get back up on their feet and they come down the mountain (verse 9), where there are living people, with living problems, in need of healing and wholeness (see verses 14-21). Following Christ is not always about having our heads in the clouds. We also have to have our feet planted on the ground, firmly and fearlessly. Why are they told not to talk about this again until after the Resurrection? They are going to be reminded of these experiences again after the Resurrection, when the Risen Christ tells them again and again not to be afraid, to fear not (see Matthew 28: 10; Luke 34: 28; . And they are going to be reminded of these experiences again at the Ascension, when a cloud takes Christ out of sight and they stand there gazing up toward heaven. But when an angel asks them why they still have their heads in the clouds, they realise they should have their feet on the ground and make their way back to Jerusalem (see Acts 1: 9-12). As we begin our journey through Lent to the joys of Easter, I hope we can explore the ways Christ invites us to have our heads in the clouds, our feet firmly on the ground, and to follow him fearlessly. Amen. 1 Καὶ μεθ' ἡμέρας ἓξ παραλαμβάνει ὁ Ἰησοῦς τὸν Πέτρον καὶ Ἰάκωβον καὶ Ἰωάννην τὸν ἀδελφὸν αὐτοῦ, καὶ ἀναφέρει αὐτοὺς εἰς ὄρος ὑψηλὸν κατ' ἰδίαν. 2 καὶ μετεμορφώθη ἔμπροσθεν αὐτῶν, καὶ ἔλαμψεν τὸ πρόσωπον αὐτοῦ ὡς ὁ ἥλιος, τὰ δὲ ἱμάτια αὐτοῦ ἐγένετο λευκὰ ὡς τὸ φῶς. 3 καὶ ἰδοὺ ὤφθη αὐτοῖς Μωϋσῆς καὶ Ἠλίας συλλαλοῦντες μετ' αὐτοῦ. 4 ἀποκριθεὶς δὲ ὁ Πέτρος εἶπεν τῷ Ἰησοῦ, Κύριε, καλόν ἐστιν ἡμᾶς ὧδε εἶναι: εἰ θέλεις, ποιήσω ὧδε τρεῖς σκηνάς, σοὶ μίαν καὶ Μωϋσεῖ μίαν καὶ Ἠλίᾳ μίαν. 5 ἔτι αὐτοῦ λαλοῦντος ἰδοὺ νεφέλη φωτεινὴ ἐπεσκίασεν αὐτούς, καὶ ἰδοὺ φωνὴ ἐκ τῆς νεφέλης λέγουσα, Οὗτός ἐστιν ὁ υἱός μου ὁ ἀγαπητός, ἐν ᾧ εὐδόκησα: ἀκούετε αὐτοῦ. 6 καὶ ἀκούσαντες οἱ μαθηταὶ ἔπεσαν ἐπὶ πρόσωπον αὐτῶν καὶ ἐφοβήθησαν σφόδρα. 7 καὶ προσῆλθεν ὁ Ἰησοῦς καὶ ἁψάμενος αὐτῶν εἶπεν, Ἐγέρθητε καὶ μὴ φοβεῖσθε. 8 ἐπάραντες δὲ τοὺς ὀφθαλμοὺς αὐτῶν οὐδένα εἶδον εἰ μὴ αὐτὸν Ἰησοῦν μόνον. 9 Καὶ καταβαινόντων αὐτῶν ἐκ τοῦ ὄρους ἐνετείλατο αὐτοῖς ὁ Ἰησοῦς λέγων, Μηδενὶ εἴπητε τὸ ὅραμα ἕως οὗ ὁ υἱὸς τοῦ ἀνθρώπου ἐκ νεκρῶν ἐγερθῇ. 1 Six days later, Jesus took with him Peter and James and his brother John and led them up a high mountain, by themselves. 2 And he was transfigured before them, and his face shone like the sun, and his clothes became dazzling white. 3 Suddenly there appeared to them Moses and Elijah, talking with him. 4 Then Peter said to Jesus, ‘Lord, it is good for us to be here; if you wish, I will make three dwellings here, one for you, one for Moses, and one for Elijah.’ 5 While he was still speaking, suddenly a bright cloud overshadowed them, and from the cloud a voice said, ‘This is my Son, the Beloved; with him I am well pleased; listen to him!’ 6 When the disciples heard this, they fell to the ground and were overcome by fear. 7 But Jesus came and touched them, saying, ‘Get up and do not be afraid.’ 8 And when they looked up, they saw no one except Jesus himself alone. we see your glory in the face of Jesus Christ. his power to change and save. This we ask through Jesus Christ our Lord. This sermon was shared at the Eucharist in Holy Trinity Church, Rathkeale, on 26 February 2017. 9.45 a.m., Morning Prayer, Kilcornan Church, Castletown, Pallaskenry, Co Limerick. This sermon was shared at Morning Prayer in Kilcornan Church, Castletown, Pallaskenry, Co Limerick, on 26 February 2017. This morning (26 February 2017) is the Sunday before Lent. I am leading Morning Prayer in Kilcornan Church, Castletown, Co Limerick (9.45 a.m.), presiding at the Eucharist in Holy Trinity Church, Rathkeale (11.15 a.m.), and preaching in both churches. The Readings are: Exodus 24: 12-18; Psalm 99; II Peter 1: 16-21; Matthew 17: 1-9. The theme, is the Transfiguration, and as we prepare for Lent, it offers interesting challenges to our ideas of discipleship. From today, I am using this Prayer Diary for my prayers and reflections each morning this week and throughout Lent. Why not join me in these prayers and reflections, for just a few moments each morning? To be authentic is to be truly who we are, uniquely, as God created us in our humanity. 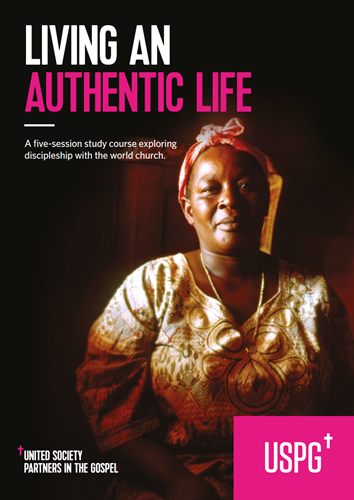 So how can we become more authentic in our lives? Primarily, by daring not to pretend. Discipleship is not about being ‘good’ but about being ‘real’. God does not love me because I try to be good – God loves me simply because I am me! God loves each of us in our woundedness, in our strengths and in our weaknesses. God is always with us. We cannot be separated from God, who knows us better than we know ourselves – so we can dare to be honest before God. God will never be shocked or surprised or reject us no matter what we do or think – we can dare to be authentic. By pretending to be ‘good’ – rather than real, human and authentic – the only person we are kidding is ourselves. Indeed, we often reject ourselves because we are afraid to believe (or experience) that God can love us for who we truly are. The upholders of patriarchy in the twenty-first century say women cannot (should not?) be involved in many areas of life. Happily, Jesus does not think this way. Everyone – whatever their gender – can be a disciple! Jesus’ life demonstrated his liberating attitude to women: he wanted to support women and be supported by women. Sadly, the church has largely failed to adopt the same attitude – and one of our tasks as disciples is to change minds and work for a more inclusive church and society. We need to change how we think and ensure that our ‘history’ is also our ‘her-story’. I recently read a book about the birth of Jamaica’s labour movement and the battle for the nation’s independence. A key player was Gladys Longbridge, a young Christian trade unionist who benefited the lives of thousands of Jamaica’s hard-pressed workers. However, she is rarely remembered in this way. Instead, since her death in 2009, Gladys is mostly remembered as the devoted secretary and later wife to Jamaica’s first prime minister and national hero Sir Alexander Bustamante. This Lent, may we acknowledge that Jesus gives permission for all people – including women – to fully participate in life as disciples. each of us a precious child in your sight. and work for the inclusion and empowerment of all.